The Laboratory of Neuro Imaging at the University of Southern California recently received a $21.7 million research grant from the National Institutes of Health to study epilepsy. Epilepsy is currently incurable, and the research team supported by the recent NIH grant will work toward finding a cure and developing treatments to prevent the condition. Epilepsy causes a disruption of electrical communication between neurons in the brain, leading to seizures. Because the seizures are unpredictable and can vary greatly in severity, and because epilepsy affects millions of people world-wide, working towards a cure is an important endeavor. The researchers involved with the study, the Epilepsy Bioinformatics Study for Antiepileptogenic Therapy, will identify biomarkers associated with the condition's development. They hope to develop therapies to prevent epilepsy from starting after a traumatic brain injury, one of its main causes. Unlike other causes of epilepsy such as stroke, brain tumors or central nervous system infections, researchers are able to reproduce brain injuries in animal models. This will allow the researchers involved in the study to gather the comprehensive data necessary to developing effective interventions. Even though the researchers of this study will rely on studying epilepsy caused by brain injury, current understanding of the condition is that it has consistencies across affected individuals regardless of its cause. According to USC News, this means that "treatments and interventions that will prevent epilepsy from occurring after traumatic brain injury will likely have wide applicability to the other." In other words, a cure for post-traumatic epilepsy should lead to a cure to all epilepsy. The study will be led by researchers at the USC Laboratory of Neuro Imaging within the USC Mark and Mary Stevens Neuroimaging and Informatics Institute. The institute aims to use imaging and information technologies to enhance studies of the brain. According to Arthur Toga, director of the institute and a key investigator in the recently-funded study, "advances in technology are expanding the scope of what we can measure, how precisely we can take those measurements, and how quickly and easily we can analyze and disseminate that information. We at the USC Laboratory of Neuro Imaging and the USC Mark and Mary Stevens Neuroimaging and Informatics Institute are excited to be both at the forefront of this new era of possibility and a hub for such an important collective endeavor." On April 19th, 2017 Biotechnology Calendar, Inc. will be hosting the 16th Semiannual BioResearch Product Faire™ at the University of Southern California on the Health Sciences campus. If you are a laboratory equipment supplier, this is an excellent opportunity to meet with life science researchers at this prestigious research market and educate them about your lab or chemical supply products. 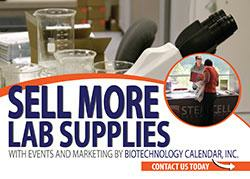 Life science professionals are invited to attend the upcoming trade fair for free. To pre-register or get additional information, click on the button below. While in the area, lab supply companies may also want to consider exhibiting at the 39th Semiannual Biotechnology Vendor Showcase at UCLA the following day, April 20th, 2017.